Have you suffered multiple ankle sprains? Do you roll your ankles easily? Is there some swelling that just won’t clear out and makes your ankles look puffy? Are you finding that your ankles feel weak and unsteady walking on uneven ground? If so – acupuncture might be the answer to finally clearing up those old injuries! People who have had multiple ankle sprains on the same ankle, especially if the sprains were quite severe, likely have a lingering deactivation of the muscles around the ankle. Acupuncture can help stimulate these muscles and help them function at their optimal level again. By stimulating points in the front and back of the leg, in the ankle and in the foot we can really have a significant impact on the functioning of the lower leg/foot complex. It is also possible that you’ve experienced damage to the ligaments (bone-to-bone connections) and/or tendons (muscle-to-bone connections). Acupuncture can help strengthen these connections and heal the injured tissue. Learn more about Dr. Jenn and how she can help with acupuncture treatment in Oakville here. If you suffered a broken ankle and had to wear a boot, or were in an ankle brace for a long time the top of the boot/brace can have a negative impact on some of our nerves – specifically the superficial fibular nerve. This nerve can get squished by the compression of the brace and can lead to pockets of swelling that stick around for a long time! If you’ve worn any sort of brace or boot and have noticed that months and years after the injury has ‘healed’ that you still notice puffiness in the outside of your ankle and top of your foot, your superficial fibular nerve might be affected! 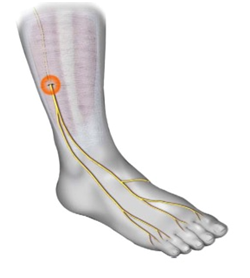 There are a few excellent acupuncture points that target this nerve and can help clear out persistent ankle swelling. Ankle Exercises can be found here. If you have rolled your ankles more than once, chances are there is some lasting damage to the deep ligaments in the ankle. It is possible to insert a needle right into the ankle joint! This can actually re-stimulate the healing process that inevitably slows down over time. Inserting a needle can increase blood flow to the area and bring nourishment to the tissues to promote further healing. Acupuncture is the only modality that can be inserted directly into the joint to promote healing and this makes it one of the most effective treatments for ankle sprains. Acupuncture can help alleviate pain (even if its been occurring for months or years), increase the range of motion, decrease swelling and help ensure that the nerves and muscles are functioning optimally.